Bitwise Industries Inc. of Fresno says it has received a two-year grant of $350,000 from the James Irvine Foundation to help pay for its Geekwise Academy web developer job readiness programs. The programs train unemployed and underemployed workers in the San Joaquin Valley for middle-wage jobs in the tech industry. One of the biggest problems facing the tech industry is the inabilityto find talent fast enough to keep up with demand. The purpose of Geekwise, theeducational arm of Bitwise, is to train software developers in Fresno. To date,Geekwise says it has educated 3,500 students and intentionally cultivated astudent population that is more than 50 percent female, 50 percent minority and20 percent first-generation immigrant. Black Bear Diner is taking over the former Marie Callender’s Restaurant & Bakery space on West Shaw Avenue. It is slated to open in February or March of 2019. The first Black Bear Diner in Fresno is one step closer to opening. The owner of the restaurant said Thursday that the location at 3602 W. Shaw Ave. is scheduled to open in February. She has not set an exact date. The restaurants are hugely popular among diners in the central San Joaquin Valley, who have long wanted to open one in Fresno. The Fresno Black Bear is owned by Amy Rose, who revealed new details about the restaurant Thursday. It is taking over the 7,108-square-foot former Marie Callender’s Restaurant & Bakery near West Shaw and Marty avenues. It will seat 226 people. The diner will have a meeting room with Wi-Fi available for large groups. Black Bear Diner will be open from 6 a.m. to 10 p.m. Sundays through Thursdays, and from 6 a.m. to 11 p.m. Fridays and Saturdays. The location will employ 92 people and has hired some workers, but is looking for more. Available positions include cooks and prep cooks and experienced servers, hosts and bussers. Interested applicants can apply online at Indeed.com. Positions range from minimum wage to $16 an hour, according to the website. This will be Black Bear’s seventh restaurant in the area owned by the Rose family, including Bob Rose, who owns locations in Visalia, Madera, Tulare, Porterville, Hanford and Los Banos. The family had been planning to build a location in Clovis, but decided to open the restaurant in Fresno instead. The brand has 119 diners in 12 states. Employees at Wonderful Pistachios & Almonds in Lost Hills clap on Wednesday after hearing that full-time employees will be getting a $15 minimum wage starting Jan. 1. The Wonderful Co. announced on Wednesday that it is increasing its minimum wage to $15 an hour for all its full-time California employees as of Jan. 1. The change will give more than 2,000 of its employees a 36 percent jump in pay, as the company currently pays a minimum wage of $11 an hour. The company said the increase marks an $80 million investment in its workers across all of its divisions and is the largest wage increase in company history. The move comes as the state is working toward a $15-an-hour minimum wage by 2022. Gov. Jerry Brown approved a law in 2016 that steadily increases the minimum wage by a dollar every year, from $10 to $15. The company said employees were notified of the pay increase on Wednesday during meetings at some of the company’s facilities in the county. Roja said he thinks the wage increase is going to make a difference not just for his co-workers but for their families as well. Fellow employee Yesenia Osornio said the wage increase is just one way the company has shown support for its employees and their families. “It’s a great company to work for, not only for the wages but the charter schools, scholarships and other things that they do,” she said. Company officials said full-time employees who make more than the benchmark $15 per hour also will benefit with higher wages; however, it’s unclear what the amount might be or when it might happen. Dave Szeflin, executive vice president of Wonderful Pistachios and Almonds, was excited to see the response the announcement about the increase would get from employees. “What we’re trying to do is make The Wonderful Company the employer of choice in the Valley, and this is a big step in getting us there,” he said. Szeflin said he hopes other Kern County companies will follow The Wonderful Co.’s example, but said that is unlikely to happen immediately. Wednesday’s announcement caught some industry insiders off guard. Huckaby said his company will continue to offer their workforce competitive wages and benefits that allow for a sustainable future. He cautioned about equating Grimmway to other ag companies, as it’s not an “apples to apples” comparison. UC Merced is growing and changing and one of the biggest changes will be a new standalone business and management school.By Nathalie GrandaFriday, December 14, 2018 04:18PMMERCED, Calif. (KFSN) –UC Merced is growing and changing and one of the biggest changes will be a new standalone business and management school. The university is working to create a new interdiscplinary school, one that university officials are calling the “management school of the future”. “We’re taking existing programs, putting them together and focusing them together on this complex system,” Gallo School Planning Initiative Director Paul Maglio said. The new Gallo school will bring together educators from the schools of engineering, natural sciences and humanities to teach students under one main focus. The university is already known for its focus on research and science, and the new school will be incorporating those science components into their program. “In a business school, you tend to focus on profit. In natural resources you tend to focus on the planet. In cognitive science, you tend to focus on people. We’re bringing all that together to have a sustained focus all at the same time,” Maglio said. The university’s Ernest & Julio Gallo School of Management already has graduate business programs. Graduate student Taylor Fugere said the science-based business program is what drew her to UC merced, and she’s hopes a new school will bring more interested students. The process will take a few years. Ultimately, the new school will need to be reviewed and approved by several campus administrators, and the University of California regents. University officials hope to have the school in place by 2021. Worker shortage turns US labor market on its head as lower-paying jobs become plentiful and put pressure on employers to pay higher wages. A surprise shortage of blue collar workers is changing the contours of the U.S. labor market, boosting their pay, narrowing wage inequality and drawing more women into those jobs. The shortfall is being driven by a shrinking supply of manual and low-pay service workers as the labor force becomes more educated and less willing to take on such jobs, according to a new Conference Board study. “The divergence between blue collar and white collar supply is going to persist and even become bigger through 2030,” Gad Levanon, chief economist for North America at the New York-based research group and one of the authors of the report, said in an interview. That is likely to keep upward pressure on labor costs in such industries as construction, transportation and accommodation and food services. It also has implications for inflation and for the Federal Reserve as Chairman Jerome Powell and his colleagues try to sustain the 9-1/2-year-old expansion without overheating the economy. Unemployment at 3.7 percent is the lowest since 1969 and running well below Fed estimates for its long-run sustainable rate. “The acute shortage of talent in the blue collar space is very, very pronounced,” said Peter Quigley, executive vice president at Kelly Services Inc., a staffing company with branches in all 50 states. Manufacturers and other companies with physically demanding jobs are finding it tough to fill those positions when baby boomers retire. “It’s harder and harder to attract younger people into those jobs, either because they’re pursuing education alternatives or the stigma associated with light industrial work,” Quigley said. The supply of lower-skilled workers is also being squeezed by growth in the number of Americans who’ve claimed disability benefits and dropped out of the labor force. Exacerbated by the opioid epidemic, that’s much more concentrated in the population without a bachelor’s degree, the Conference Board report says. Tighter restrictions on immigration are also playing a role and will continue to do so in the future, said Moody’s Analytics’s Chief Economist Mark Zandi. Many of those foreign workers are lower-skilled and in industries such as construction and farming. For much of this expansion, manufacturers and other companies have been slow to ramp up capital spending and step up automation, opting instead to take on more workers to meet rising demand for their products and services. That’s been reflected in the slow growth of productivity: Output per hour worked has risen at an annual average rate of 1.2 percent since the recession ended in June 2009, well below the 2.2 percent post World War II pace. The combination of surprisingly robust demand for blue collar workers and their limited supply is forcing companies to increase pay at the bottom end of the scale. Minimum wage increases have also helped those less well-off. That’s helping to reverse the decades-long trend toward greater wage inequality, according to Levanon, who co-wrote the report with economist Frank Steemers. Besides granting bigger wage increases, companies are getting creative in offering other perks to employees, including more breaks, re-jigged work schedules and greater flexibility for working parents, Quigley said. The improved packages look to be attracting more women into blue collar jobs. “It helps remove some of the inhibitions or reluctance” some women may have in taking those positions, Levanon said. The increase in female participation is particularly evident in the transportation sector, where demand for workers has taken off because of the growth of online shopping. “It’s probably ground zero for labor shortages,” Levanon said. From left, Quady Winery controller Doug Dennis, marketing manager Colin Hough, and winemaker Darin Peterson stand in a warehouse built in 1983 and designed by San Francisco architect Stanley Saitowitz and winery founder Andrew Quady. On April 14, 1984, Quady Winery officially broke ground on phase one of its new facility designed by San Francisco architect Stanley Saitowitz and vintner Andrew Quady. ribune, the new building would allow the family winery to bottle its wines year-round, instead of only in winter and spring, thus tripling output. But it was just the first of several phases planned, and the design of Quady and Saitowitz wouldn’t be fully realized until 1998. Now the winery is more than halfway through a new series of expansions that may be complete as early as 2021. “We’re in year three of a five-year expansion project where we’re growing the winery from roughly 70,000 cases to 160,000 cases” of annual production, said Doug Dennis, controller of the winery. “And even more next year,” predicted winemaker Darin Peterson, who said 85-90 percent of the grapes used in the wines are Madera grown, though some grapes come from as far away as Manteca. This year, the winery finished building a 22,000-square-foot warehouse. Rather than emphasize “visual impact” as with the winery’s earliest expansion, the trend now is using technology “to make a huge impact on how productive the business is,” Dennis said. To beat the heat, the new warehouse is covered in 500 white panels that are each four inches thick, and beside it sits a “heat exchanger” with about 28 times the cooling capacity of a typical home air conditioner, as estimated by the U.S. Department of Energy. The tanks are individually temperature controlled. The winery may add three more wine tanks in the next few years, resulting in about 360,000 more gallons in capacity. Not yet finished, the warehouse will eventually feature five offices, a laboratory, a cafe-like break room, a conference room, restrooms, and an observation deck. The Quady family has tried to make its latest expansions “green,” according to Dennis. The LED lighting of the warehouse only consumes about 500 watts, he said, and office area sensors will adjust light intensity based on “whether someone is in the room, how bright it is outside,” etc. Photovoltaic solar cells able to generate 300 kilovolts sit on winery buildings to help power the facilities. In the future, a Tesla Powerwall to store energy may be added, which would allow the winery to be more electrically self-sufficient. All the recent expansions are, of course, not without cost. “It’s a pretty big, seven-digit investment,” Dennis said. “I think this building, when it’s completed with the tanks, will be $3.5” to $4 billion. Dennis said they’re looking forward to putting the current expansions behind them and enjoying the benefits. An organic fertilizer production facility is being opened inTurlock by Darling Ingredients Inc. (NYSE: DAR) of Irving,Texas.The facility is located on a 21-acre site and will have the ability to make 35,000 tons of fertilizer a year. It will be marketed under the brand name Nature Safe Natural & Organic Fertilizer.The new plant will also provide 4,500 tons of storage capacity to meet the needs of organic growers operating in California and the West. the company says. Darling has been making its organic fertilizer at its original Henderson, Kentucky, plant since the early 1990’s, where it will continue to produce for customers in the rest of the country. The company says the strength of the organic fertilizer market in the western U.S. has it working on plans to double the new Turlock plant’s production capacity by end of year 2019. The company is focused on a growth strategy in California where it can leverage Darling’s diverse supply of animal feed ingredients, says Mike Manning, Darling’s vice president of organic fertilizer and innovation. With long-established rendering facilities in Los Angeles, San Francisco, Fresno and Turlock that produce feather meal, blood meal, and meat &bone meal, the company is able to produce the high quality organic fertilizers with cost-effective proficiency, he says. When the new Turlock plant begins production in January, it will bring on a new management team. West Regional Commercial Business Manager Dan Rodriguez will develop go-to-market strategies. Kevin Van Dewark has joined Darling Ingredients as plant manager for the new Turlock fertilizer plant, and Mayra Pena will be its new office manager. United Parcel Service (UPS) is moving forward on plans for its new Visalia distribution hub this month. Blueprints call for a 425,000 square foot facility expected to employ 600 people. Mayor Warren Gubler said he and City Manger Randy Groom met with UPS representatives about a month ago. ”They told us they want to build their plant next year and it will bring 300 more jobs to Visalia,” Gubler said. UPS bought 58 acres last year at the northeast corner of Plaza and Riggin avenues, the first development that would be north of Riggin in the industrial park. Asked about the plan, a UPS spokesman said they had no comment. But local Teamsters, who have a contract with UPS, say they have been advised of the plan.” UPS Visalia has about 274 employees now and they have told us they want to add 300 to 400 more,” says Teamsters Local 948 Secretary Adam Ochoa. ”They want to start construction right away” adding that UPS wants to be operating in time for next year’s busy holiday season. The UPS Visalia facility is expected to be the new Central Valley regional hub for ground shipments with room to expand if necessary. UPS is expanding its logistics hubs all around the country as they struggle to handle the ever-increasing demand from online shopping. Community Development Director Nick Mascia says the city is working directly with UPS and their contractor on a plan that would place the new distribution facility on the north end of the property with vehicular access from both Riggin Avenue and Plaza Drive. UPS has a smaller 40,000 square foot distribution center on Goshen Avenue they will no longer need once the large new highly automated facility opens. Mascia says in their building design process they are working first on a design for the conveyor systems to handle packages at the new Visalia plant. And business is brisk. Nationally UPS package volume has increased 4.9 percent in the second quarter of this year even as their domestic revenue was up 8.1 percent. UPS investment in new facilities and technology appears to be paying off as they compete to deliver on time. UPS delivered 98.3 percent of packages shipped during Thanksgiving week on time, according to ShipMatrix Inc. Last year during the same week, 89.2 percent of parcels shipped through UPS Express were delivered on the day they were promised, meaning about 3.3 million packages a day arrived late. The Wall Street Journal say UPS has added 22 new or retrofitted automated facilities in the U.S to handle the crushing volume of packages arriving at our front doors. In August 2017, UPS purchased the 58 acres in Visalia’s industrial park. The big block of land was bought from developer Central California Logistics Center who had available some 480 acres of land north of Riggin Avenue on both sides of Plaza Drive. With UPS in place, demand for the remaining 400-plus acres should pick up. Because of UPS’ plans, there will likely be more of these hubs sprouting along what has been open-range land on the sparsely populated northwestern edge of Visalia. With little congestion and plenty of land available, UPS made a decision to invest in this property with their distribution hubs in Fresno and Visalia. Those hubs have been very busy and highly impacted by nearby development that has boxed them in — thwarting any kind of future major expansion. For years, Visalia has promoted its center-state location and the presence of a major UPS transportation hub with access to 98 percent of California’s population via overnight delivery — 95 million consumers. This presence is also credited with attracting scores of other distribution centers that use UPS for overnight shipping, claims about which both Visalia and Fresno boast. One company, Diversified Development Group of Fresno, has invested heavily in buying land and developing “spec,” — or speculation — buildings before firm commitments. DDG has three developments within a block of the new Visalia UPS complex and expects more deals as large as 1 million square feet. Recently, power toolmaker Hilti Inc. leased a new 166,000 square foot warehouse just built by DDG next to VF Corp. on American Avenue at Riggin Avenue. DDG also has plans for a new 700,000 square foot set of four “spec” buildings expected to break ground in 2019 at the southeast corner of Plaza and Riggin avenues. Helping to highlight the location of these properties is the completion of the new $36 million Betty Drive interchange, less than two miles away at Highway 99. This will speed truck traffic in and out of the Visalia Industrial Park. The hot markets that drove U.S. housing in recent years (we’re looking at you, coastal tech hubs) will give way in 2019 to a new group of affordable, young, opportunity-filled, desirable – and largely inland – cities primed to drive growth in the years to come. Job growth over the past year, as a measure of a robust economy. Vacancy rates, as an indicator that housing supply does not exceed demand. Good starter-home affordability, as a signal that first-time home buyers stand a chance at buying a home. More inbound than outbound home searches on Trulia, as a gauge that more people are interested in that market than those looking to leave. A large share of the adult population under the age of 35, which represents more potential first-time buyers. Strong employment growth and a large share of young residents helped put Colorado Springs, Colo. at the top of the list of markets to watch (the area ranked in the top 10 of the largest 100 metros for both metrics). After topping last year’s list, Grand Rapids, Mich., came in second this year, with employment growth and low vacancy rates contributing to its strong performance. Jacksonville, Fla., is third due in large part to its strong inbound-to-outbound search ratio. Two Central California markets – Bakersfield and Fresno, the lowest-priced California housing markets among the largest 100 metros – also made the list this year. Keen-eyed readers will notice a few things in common amongst the 2019 stars on this list. It does include a couple well-known growth areas including Phoenix, Ariz., and Austin, Texas. But it also highlights markets relatively close to more-expensive metros, but far enough away to offer their own attractions and opportunities without many of the mounting affordability concerns that mark those marquee names. Think Colorado Springs instead of Denver, and Bakersfield and Fresno instead of Los Angeles and the Bay Area. We also identified the hottest neighborhoods in these markets, based on both local price appreciation and how quickly homes are flying off the market. 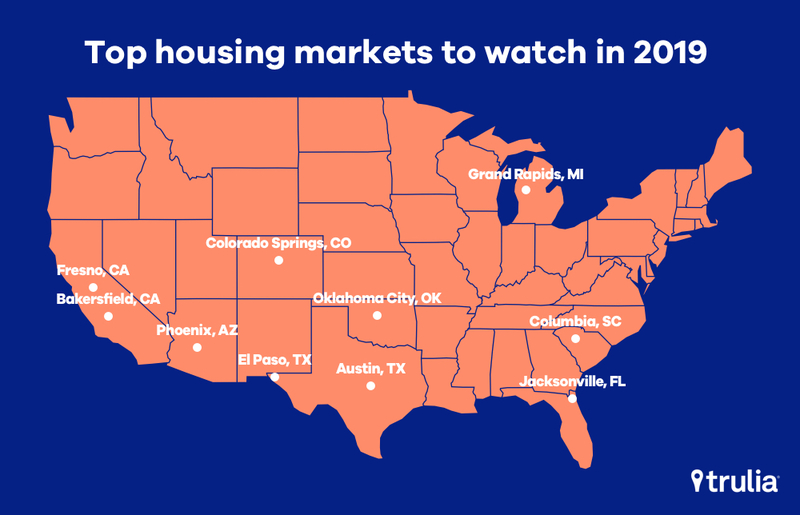 Note: Rankings for housing markets to watch from among the 100 largest metros. While there will certainly be local bright spots like the ones we’ve identified, in general we expect 2019 to be a year of moderation and continued transition in the U.S. housing market. After several years of breakneck appreciation following the end of the housing recession, the latter half of 2018 may have marked a turning point and the beginning of a return to more normalcy and balance in the market. Next year will continue to bring more sanity to the market for home buyers frustrated by years of stiff competition and chronically low inventory. But affordability concerns will still plague the market, especially as mortgage rates rise, putting buyers in a wait-and-see mode. Sellers will also respond to changes, potentially thinking twice before listing in an environment that may not be as lucrative as it was in recent years and further slowing buying and selling activity. For more on Trulia’s outlook on housing next year, check out our predictions for 2019 here. Employment growth is measured as the percentage increase in employment between September 2017 and September 2018, according to the Bureau of Labor Statistics’ Local Area Unemployment Statistics program. Residential vacancy rates (October 2018) are reported by the U.S. Postal Service’s Delivery Statistics and retrieved through Moody’s Data Buffet. Starter home affordability is determined using the median listing price of starter homes on Trulia in the third quarter of 2018. Household incomes are derived from 2016 American Community Survey microdata, adjusted to the current period using the Employment Cost Index. The ratio of inbound-to-outbound searches on Trulia is calculated using site traffic from October 2017 to the present. The share of population under 35 comes from U.S. Census Bureau estimates as of July 2017, released in June 2018. The final score is tabulated by averaging the rank of these five metrics. The change in days on market since last year (where bigger drops in days on market indicate a hotter market). A neighborhood’s “hotness” is based on the sum of these ranks. Neighborhood-level days on market metrics are calculated using data for the 12 months ending September 2018. Neighborhood-level home values are based on the month of September 2018.